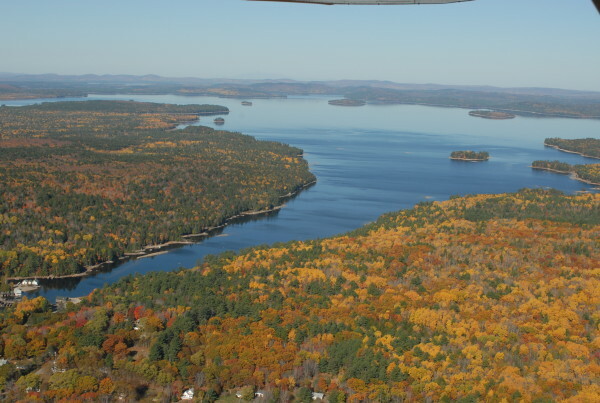 This file photo, taken above the village of Grand Lake Stream, shows some of the 21,000 acres east of West Grand Lake (on the right side of the photo) acquired by Downeast Lakes Land Trust. GRAND LAKE STREAM, Maine — With the addition of a large tract of forest, a local conservation organization has increased the amount of land it owns surrounding West Grand Lake by nearly 22,000 acres, the land trust announced Friday. Downeast Lakes Land Trust has acquired 21,870 acres between the lake and Big Musquash Stream to the east, according to a prepared statement released by the group. Combined with the 34,000 acres the trust already owns on the western side of West Grand Lake and along the shores of Pocumcus, Wabassus, Third Machias and Fourth Machias lakes, the added acreage will boost the amount of abutting land owned by the organization to nearly 56,000 acres. By comparison, that’s more than half the size of the 87,500 acres of land owned by Elliotsville Plantation Inc. just east of Baxter State Park, which the firm is hoping will become a federal national monument sometime this summer. The two conservation projects are unaffiliated with each other. The Downeast Lakes Land Trust’s added acreage east of West Grand Lake includes more than 17 miles of shoreline on Big, Lower Oxbrook and West Grand lakes and more than 90 miles of stream banks. The combined 55,578 acres of woods in northern Washington County owned by Downeast Lakes Land Trust, though conserved from development, will continue to be managed as a community forest where fishing, hunting and sustainable timber harvesting is allowed. “As with all its holdings, with this latest acquisition, the [Downeast Lakes Land] Trust affirms its commitments to permanent public access, to traditional use, to wildlife habitat, and to sustainable forestry,” Sydney Lea, president of the trust’s board, said in the statement. The transfer of the forested land, called the West Grand Lake Community Forest, from Lyme Timber of Hanover, New Hampshire, to the land trust marks the finale of an eight-year, $19.4 million campaign to acquire the property, land trust officials indicated. The specific purchase price for the property was not disclosed in the release. Officials with the trust have said the project was the “ last big piece” of a 15-year effort effort by the trust, which was founded in 2001, and local and state officials to protect more than 350,000 acres of undeveloped woods surrounding the pristine lakes of northern Washington County. The acquisition comes 3½ years after the state purchased a conservation easement on the same property, protecting it from development. There are a dozen or so commercial camps in the Grand Lake Stream area that cater to tourists who come to enjoy the outdoors. The 21,000 acres was selected in 2011 as the top national priority for funding by The Forest Legacy Program of the U.S. Forest Service, which contributed more than $5.5 million to the project, according to the statement. The Land for Maine’s Future board contributed $1.25 million toward the working forest easement purchase. Many organizations and individuals contributed to the project, including major donations from the Elmina B. Sewall Foundation, The Conservation Fund, Sweet Water Trust and the Open Space Institute, trust officials said.